The more I understand about myself, the more I understand about you - your problems, your concerns, your issues. The more I change my world for the positive, the more I change *the* world for the positive. And the more I seek to change myself first, rather than fix 'faults' I see in others, the more I help others change themselves. Hmm, yes another month and another series of personal insights that light the path for me, and just wait for me to follow it. Right now, I am acutely aware of minor disturbances in my emotional life; I know I want these disturbances to disappear ("DISAPPEAR, I tell you!") then ALL will be well. When the truth is the opposite: be okay with what life brings. Or, as I read in a Guy Finley book a few years ago: "Want what life wants." 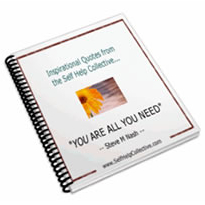 As ever, you can find the latest new and updated pages at this page: SelfHelpCollective's Self Help Blog. Listen to Heather's story -- Click here! "The full measure of a man is not to be found in the man himself, but in the colors and textures that come alive in others because of him."